Preventive dental care primary focus is on the procedures that help prevent the onset or progression of an oral disease, in an early stages, that can have long-term implication and a potentially high restoration cost in future. We strongly believe in prevention is better than cure and Dr. Seth can help you maintain optimum oral health through routine diagnostic evaluations, dental cleanings, state-of-the-art technologies and patient education. This safeguards you and your family against oral diseases like dental decay, gum disease, or periodontal disease. During our hygiene appointments we conduct comprehensive treatment plan after doing thorough periodontal exam and evalutions. With a flat screen projection of full series of digital photographs, X-rays and intraoral photographs will let you see and understand the condition of your oral health. Once Dr. Seth’s assesses your needs and goals, she’ll propose an appropriate treatment plan and cleaning best suited for you. Periodontal dentistry encompasses the care and treatment of the infection in the gums, bones and supporting tissues surrounding the teeth. Three out of four adults have some form of the disease. Periodontal disease is usually caused by plaque – the sticky film of food, bacteria that are constantly accrued on the teeth over time. At Carolina Smile Dentistry, we use Debridement technique which is thorough removal of heavy plaque and tartar using an Ultrasonic scaler. 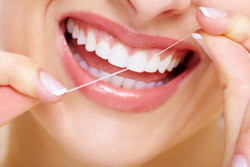 It is an effective procedure in treating periodontal disease. An Ultrasonic scaler produces soft ultrasonic vibrations. The small click vibrations alongwith the high frequency water waves thoroughly removes tartar by decreasing the number of destructive bacteria below the gum line. Antibiotics or irrigation with anti-microbials (chemical agents or rinses) may be recommended to help control the growth of bacteria that create toxins and causes periodontal disease. Follow up evaluations determine the effectiveness of the treatment by measuring the pocket depths around the teeth. In complicated cases, the patient may be referred to a periodonist. Sleep Apnea is a type of sleep disorder characterized by pauses in breathing during sleep. Oral appliances are most effective in treatment of mild to moderate Sleep Apnea. They provide a treatment alternative for patients who will not tolerate positive air pressure. Detection of soft tissue abnormalities is a step closer to fighting Oral cancer. At Carolina Smile Dentistry, we perform a thorough manual exam to check if there’s any soreness or tenderness in the jaw, or any abnormal lesions or lumps that may cause or contribute to oral cancer. 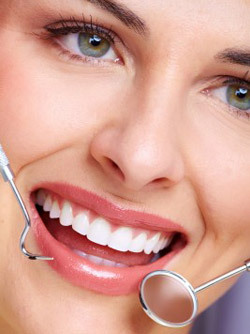 The American Dental Association (ADA) states that 60% of the US population sees a dentists every year. 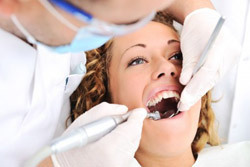 So, dental examinations when done properly which includes screening of Oral Cancer can save lives.